Hero to zero in a day!!! With rising rates of obesity and the NHS carrying out around 6000 weight loss operations a year, it’s great to see this week that the message is finally getting across about what is really ‘healthy’ and what is perceived to be healthy. Clever marketing based on flawed research, funded by food companies has influenced our perception of what is healthy. Unfortunately for us mammies out there, most of it is targeted at our children…..or indirectly targeting us as those who hand over the cash!! For years now along with fellow health conscious individuals, I have eaten a diet rich in whole and natural foods. I base my meals around good quality fish and meat, fill up on veggies, nuts and fruits and avoid refined and processed foods as much as possible. Is it that simple? Yes it really is……but not when you’re a 2 year old stubborn little boy who refuses to eat a single fruit or vegetable. Yes, me who lives and breathes health, fitness and natural foods can’t get her own son to eat this way. I have guided and helped change the way many strong minded grown men and women think about food, but try to get my toddler to eat a pea and I’m beat!!! I’ve tried the lot; hiding it in foods (which works occasionally), bribery, punishment, reward, praise, no other foods until he’s finished, all to no avail. Although occasionally for no apparent reason he will give in, usually after a meal or snack time that has lasted 3 hours; he will eat a few pieces of asparagus, green beans or a carrot without a hint of dislike……usually this is followed by a victory dance by me hiding in the hallway, because I know I’ve won this one but can’t let him know that!!! The problem is, like most busy mothers out there I don’t have 3 hours to spare. Most of the time I do hide the good stuff in a cottage pie or a casserole, but this doesn’t solve the problem that I am creating a fussy eater…….. pre children I’d have said ‘let him starve, he’ll eat it eventually’, but in reality he will always get some supper before bed because my fear of the sleepless hungry child at night is much bigger than my fear of having a child who needs vitamins to supplement his poor diet. If I didn’t have a daughter who happily snacks on broccoli, avocados, and any piece of fruit in sight I’d be beating myself up about this one. 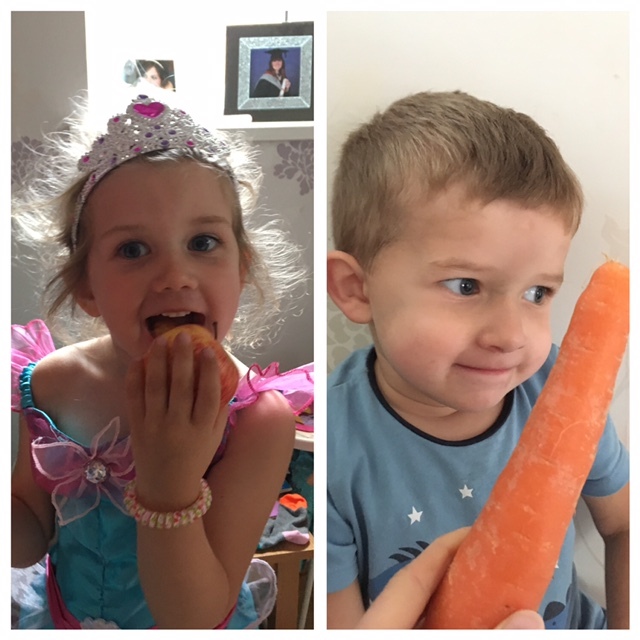 As babies, both of my children were weaned on the foods I ate…..not because I was all earth mother and righteous…..it was cheaper and easier to mash up a bit of what I ate than have a separate shopping list for them, and although I did read some of the Annabel Karmel recipes, I didn’t see the sense in cooking a meal for the kids and then another meal for myself and my husband. It helped that our food was usually a mix of healthy vegetables and protein without any additives, and I was in control……who knew, a couple of years later and I am at the mercy of a 3 foot tall genius who knows exactly how to play me. 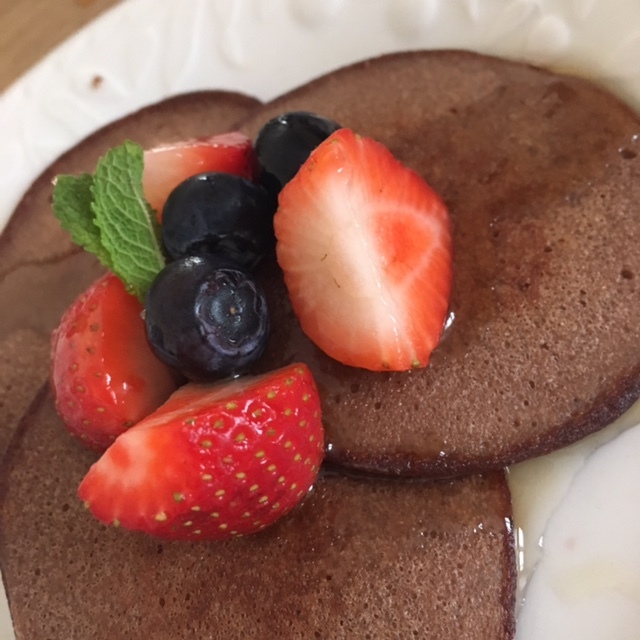 I’d love to hear your stories, secrets or tips on feeding stubborn toddlers and I’ll leave you with a recipe for a healthy pancakes he never refuses……. Blend all ingredients except the honey and set aside. Heat a pan with a tbsp. of coconut oil and pour the mixture into pan in small dollops. Depending on the size of the pan, you can usually get around 4-6 pancakes at a time. After a couple of minutes simmering, flip each pancake and simmer for another minute before serving with some honey and fruit poured over the top. Natural yogurt is another nice addition to this one.